Organizing and storage ideas, and solutions for storing, locating and using your scraps! At the moment I am crafting in a temporary space and I don’t have room for all my usual furniture, which includes my little Bisley drawer unit where I keep my scraps. I’m just using a storage box to keep them in, and since I am too lazy to rummage through it, it’s overflowing with scraps I should be using instead of cutting into new sheets! So my tip for today is to get your scraps organised! You’ll definitely find that if you organise your scraps by colour you will use them much more often. This Bisley drawer unit is the one I use. As you can see, for each colour I have both a plain, and a polka-dot labelled drawer. I keep plain sheets in one drawer and patterned paper in the other – as a result I can really quickly find a piece of paper or cardstock for matting, die-cutting or stamping without cutting into a precious new sheet! If you don’t have space for a drawer unit, there are other options for keeping your scraps organised. Well, that’s it for today’s Organizing Tips & Tricks. What do you think of what I shared? Please share your thoughts about the solutions shared above by leaving a comment. by linking to it in your comment. 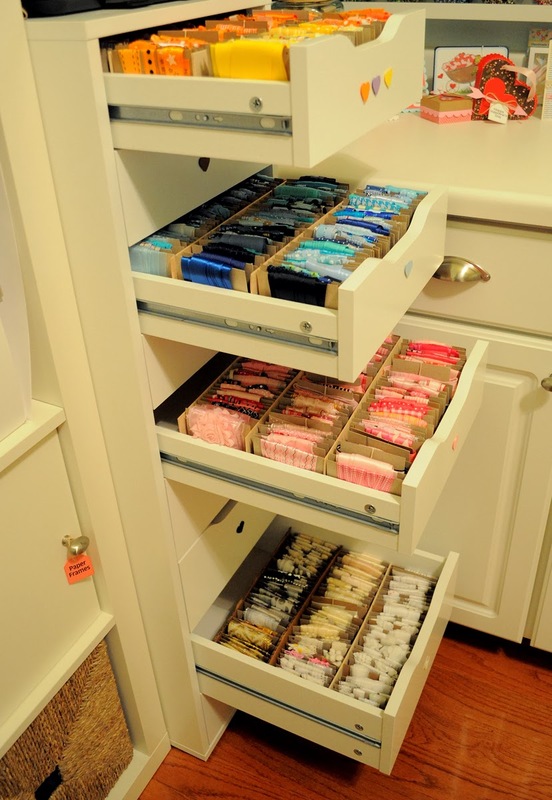 We’d love to see how YOU organize your scraps! I hope this has given you some inspiration and motivation to sort out your scraps – happy organising! Hi it’s Sharon here today and I’d like to share with you how I store my babywipes. I found that when I left them in the original packaging they often dried out as the seal would become less effective with use. You can buy plastic containers designed for baby wipes, but they were quite expensive. I recently shared with you the Hobby Life plastic containers that I use to store my embossing powders and glitters, and I realised that the size of these would be perfect for baby wipes. I used a 1.5L size as this is deep enough to hold two packs of wipes. The clip seal means that my wipes never dry out, and I keep the container handy on my desk so I can grab a wipe whenever I need one to clean my stamps or my inky hands. If I ever leave the lid off while I’m working for a long time, I can just give them a spritz with a water mister and they are good as new! I got my containers from The Plastic Box Shop in the UK, but you can get similar boxes in any dollar store or DIY outlet. Hope you’ve found my little tip useful! Hi everyone, it’s Sharon here today and I want to share with you my ideas for using Evernote software to keep track of my supplies. I had never heard of Evernote until I saw an old post on here from Cicily where she shared how she uses it. I recently made the switch from storing my stamps in CD cases to the Avery Elle storage pockets, and whilst doing so, had a bit of a clear out and got rid of a lot of older stamps. This left me with a bit of a dilemma, because I had numbered all my CD cases, and created a folder of stamped images so I could categorize them and easily find the particular stamp I wanted. The thought of starting that all over from scratch didn’t appeal so I was looking for another way to do it. I really wasn’t sure that Evernote would work for me. I do like to flip through a book to see what I have – and I have gone back to a paper planner because I can’t cope with using a digital calendar, so I was a little sceptical about it, but I’m so glad I gave it a try, because it really is fantastic. If you don’t know anything about Evernote, it’s free software, that enables you to create various ‘notebooks’, and within those notebooks you can list anything you like. It’s easiest to download the software onto a PC or laptop for creating your catalogues, but then you can also access it via an app on your phone or tablet, which is extremely useful. It also includes a snipping tool, which enables you to copy and paste anything from your screen and catalogue it. You can add ‘tags’ to each note and then search for those tags. So, to explain it better, I’ll show you what I have created so far. I started off cataloguing my stamps. So I created a notebook called ‘Stamp Catalogue’. Then I created a ‘note’ for each of my stamp sets. The format for each ‘note’ is the same, first I list the manufacturer, then the name of the set. Using the snipping tool I add a picture of the set (I usually get this from the manufacturers website), I then add tags which will give me all the information I need when searching – so I create tags describing all the images in a set, all the greetings, then additional tags such as ‘Christmas’, ‘Birthday’ etc. It really didn’t take that long to add all my sets and I am really finding it a great way to work. If, for instance, I’m looking for a greeting that says ‘Happy Birthday’, I just search the tags for that, and then I can flip through all the sets I have that are relevant. You can add more than one picture to each note, so another idea I had was to also include a photo of the stamped image along with various marker colour options. You could also add photos of cards made using that stamp in case you want to recreate them. I plan to create ‘notebooks’ for all my supplies, then, when I’m out shopping, I can quickly see what I already have. 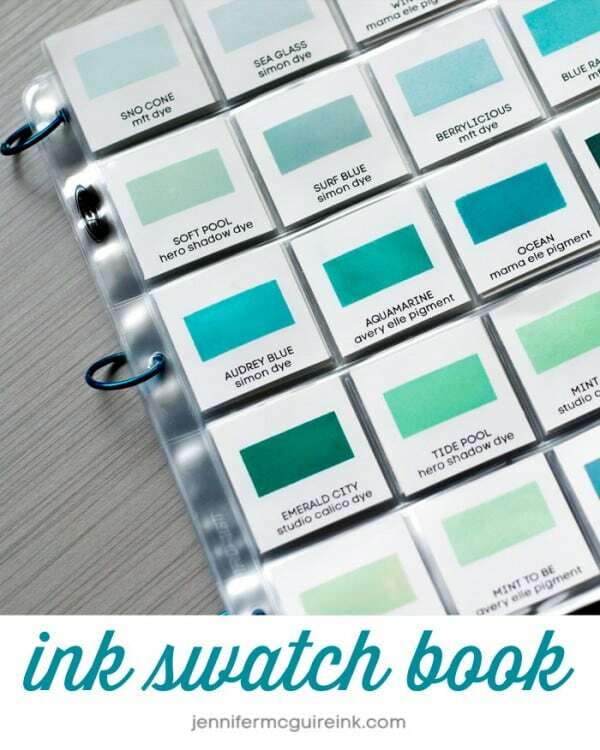 Although I have started an ink swatch book for my inks and embossing powders which I will rely on to see the true colours, I think I’m going to list them on Evernote too, just so I have a list accessible from my phone so I know at a glance what I already have. Next, I’m planning to add my Distress Inks, my embossing folders and my stencils. Since it’s accessible from my phone, I plan to add some other notebooks for all sorts of other things. Here’s some ideas of other things it could be used for – to do lists, recipe lists, shopping lists, useful snippets of code that I want to store somewhere, colour swatches, card sketches, Christmas card list, birthday present lists, storing business cards, etc. I hope I’ve persuaded you all to have a go with it – I really have found that it’s changed my life! Hi, all! Sharon here! 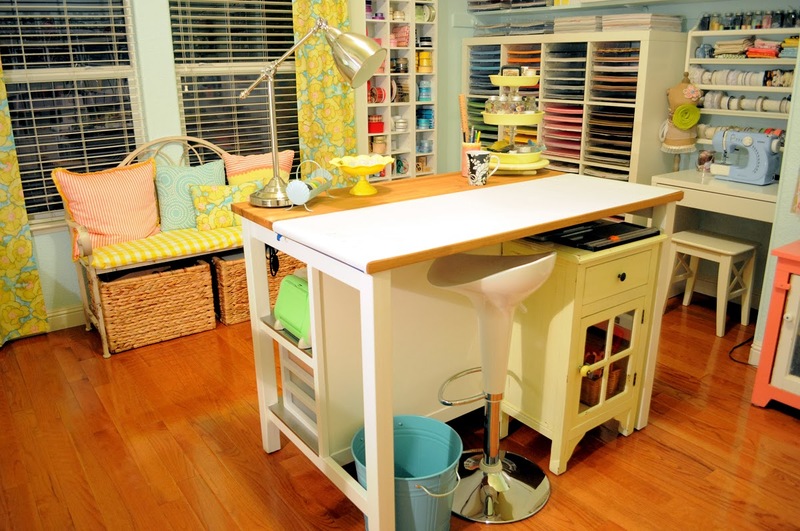 I’m just so excited to be featuring Jennifer McGuire’s studio with you today. 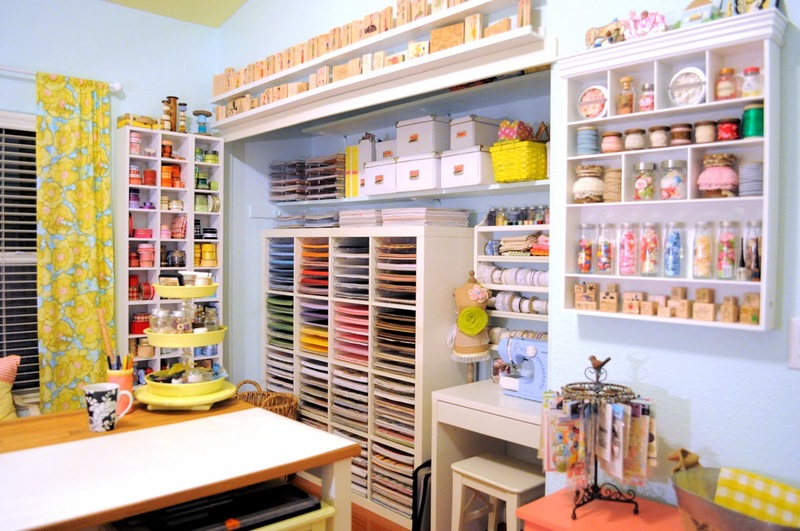 I’m a total tidy freak when it comes to my studio and how I organise my supplies, and I have got an incredible amount of inspiration from Jennifer’s blog and videos. If I could have a replica of her room I wouldn’t change a thing! If you haven’t visited her blog then it’s a must, she is the most kind-hearted and sharing person and her blog and YouTube channel are just full of great ideas, but more on that shortly. Firstly, here’s a photo of her studio. 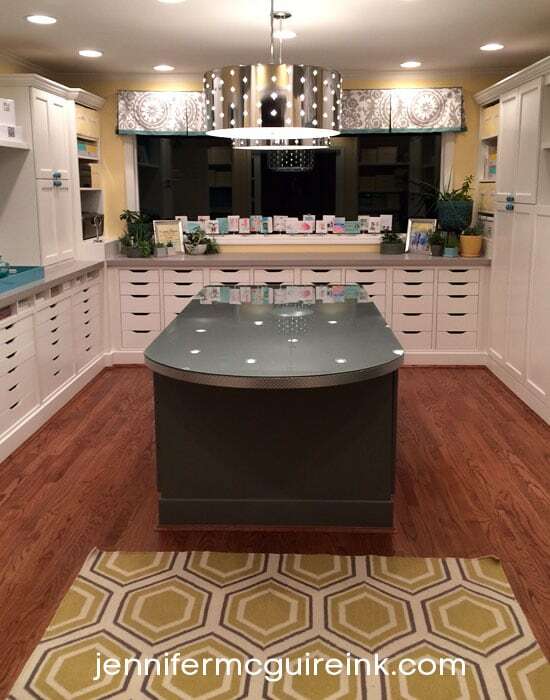 As you can see, she has a fantastic island in the centre for working on, and most of her supplies are hidden away in custom made cupboards – this really appeals to me as I can’t bear too much clutter. What I like most about Jennifer’s room is that, because she designed it from scratch, a lot of thought has gone into what products she wants close at hand, and how she wants to store them for easy access. For instance, she stores her ink pads in the centre island, so they are right by her workspace – and the OrganizeMore cubby fits perfectly. I could go on forever about this room and all the ideas I’ve picked up from Jennifer, but I’ll just share one idea here, then you can pop across to Jennifer’s blog and YouTube channel to see the rest (and I HIGHLY recommend that you do). 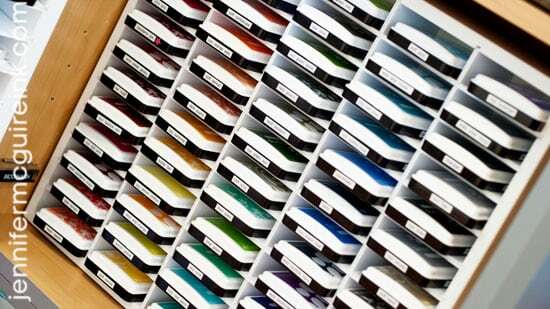 Aside from her stamp storage, one of the best ideas I’ve picked up from Jennnifer is her ink swatch idea. She uses the Simon Says Stamp ink swatch stamp set to put together a swatch book, and she so generous, that she’s even shared ink swatch downloads for almost every ink brand you can think of, so you just need to print them out, cut them to size (and she’s added cutting guide lines too), then stamp them out. I highly recommend you set aside some time, grab a coffee, and watch all her storage videos here. I guarantee you’ll be inspired to start re-organising your supplies! Thanks for popping by, and I hope you enjoy exploring Jennifer’s blog and videos. Hi everyone, it’s Sharon here with an embellishment storage idea as part of our Just one Tip for the New Year series this month. I like to have pretty items of my stash on display rather than hidden away in drawers – particularly if it’s items I can store in a rainbow order as for me, that’s just one of the nicest things to look at! A few years ago I came across this little white cupboard in a gift shop. It was on sale, but I didn’t really know what I’d put in it. My boyfriend was with me at the time and told me that I should get it anyway, as it was such a bargain I’d regret it if I didn’t. He was right. When I got home I found a little jar that I’d bought a long time ago in an art supplies shop and discovered it was the perfect fit for the little cubbies. Whilst looking online for similar jars, I came across this site selling cosmetic jars and realised this was a much cheaper option than buying from an art shop. That’s a UK site, but if you google for 30ml cosmetic glass jars I’m sure you’ll find a local supplier to you. The jars are the perfect size for flat-back pearls or sequins, and look so pretty all together. They’d look just as good lined up on a narrow shelf. I hope my jar storage has given you some ideas for your own space.